Many of you are starting to get your light boxes back out because on September 22, it was the first day of fall. 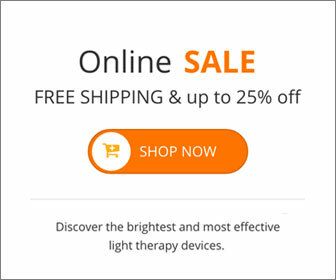 With the start of fall upon us and the amount of natural light available for our bodies to absorb is drastically reduced which can have a significantly negative effect on nearly 20% of the worlds population.¬†Seasonal Affective Disorder, or SAD, occurs when our bodies are deprived of the full spectrum light they require to function properly. Fall depression happens largely in more Northern regions of the world where the seasonal change is much more notable. Symptoms associated with S.A.D. include disturbed sleep patterns, a lack of motivation, listlessness and overall depression. The will to perform simple tasks is depleted and even getting out of bed seems pointless for many. Seasonal Affective Disorder has an adverse effect on our bodies and psyche, disturbing Circadian rhythms and sending perfectly mentally healthy people into a lethargic and depressed state. But there is something you can do to reverse the damaging effects of SAD, without having to resort to the use of medication. Since seasonal depression occurs upon the reduction of sunlight available for our bodies to absorb, doesn‚Äôt it just make sense to find a way to replace that source during the darker months? With the North Star 10,000 light box¬†you can effectively combat Seasonal Affective Disorder and reclaim your life, while restoring your natural Circadian rhythms and positive sleep patterns. The North Star 10,000 light box¬†effectively delivers 10,000 lux of broad spectrum light, providing your body with the light it needs to activate your natural mood enhancers. This brightens your demeanour, increasing energy and raising overall spirits. This entry was posted on Friday, September 24th, 2010 at 11:38 am	and is filed under Light Therapy, SAD. You can follow any responses to this entry through the RSS 2.0 feed.